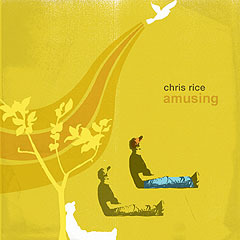 Chris's latest CD, Amusing (released August 23, 2005) taps into this broad spectrum with a variety of styles and topics. His first radio single "When Did You Fall" is a refreshingly innocent romantic-comedy kind of love song. The optimistic perspective in "Lemonade" ("...we're gonna need another straw!") balances the melancholy title song "Amusing" ("...this love can never be..."). "The Final Move" is Chris's clear and beautiful declaration of hope for humanity, stating "Paradise has up and flown away for now, but hope still breathes..."
"Tick-Tock" takes a fun and rowdy look at how we measure, waste, use, and get dragged through Time, while "The Best Song Ever" cleverly unites the human race under our shared ideal of something ultimate. "Sleepyhead Sun" nods to our consistent solar roof-warmer as proof of God's care for us. Appearing on Chris's new CD is legendary guitarist Duane Eddy, who in his own right sold over 100 million records back in the '50's and '60's. Mr. Eddy, considered one of the most influential rock 'n roll guitarists in history, contributes his unmistakable "twang" on the Prelude to the CD, a blending and remixing of sounds from the song "Love Like Crazy" in which Mr. Eddy is also featured. Says Chris, "I'm completely blown away to have Duane Eddy playing on my CD! I've always felt like an amateur in the music world, and Duane's caliber of musicianship is both humbling and thrilling at the same time. This is fun stuff!" Amusing - Chris Rice - His music IS fun stuff. Mixed with some deep stuff too. That's what you always get with this nature-loving, introverted, youthful, honest writer and singer, Chris Rice. Larry's Review: Love this CD! My favorite track is, "When Did You Fall in Love?" Click here to listen. It's a jazzy, melodic tune about the "beautiful surprise" of learning of a friend's romantic interest and stirs up many emotions. Chris Rice wrote it because he thinks there's a need for refreshing, innocent romantic songs - and to touch something in people that they've been missing.